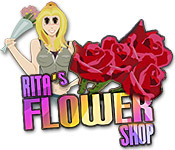 Become the best botanical beautician at Rita`s Flower Shop in this bustling Time Management game!Build beautiful bouquets!Become the best botanical beautician at Rita`s Flower Shop in this bustling Time Management game! Fill customer orders by selecting the appropriate flowers, containers and trappings! Build beautiful, tailor-made arrangements and get them to the customers as quickly as you can. Take the time to stop and smell the flowers, and turn them into profits with this exciting online game!